The partners of the USTEP Project, IEC GEMS, TheDojo.Org.UK, and YOUTHART have come together to for the second partners meeting on 24-26 March 2017 in Istanbul, Turkey, to evaluate the completed phases of the project as well as planning the upcoming events. To see photos and read the notes of the meeting, click here. 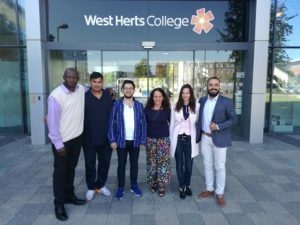 Venue: West Herts College Watford, Hertfordshire, United Kingdom. This meeting was the evaluative stage for the USTEP project an opportunity to formally quantify and measure theoutputs of an idea that we had been road testing for nearly 2 years. Ms. Tikalová who facilitated the whole session, played a crucial part in getting us to pin point each learning outcome, expected results and impact, stating where and how it was delivery as well as clarifying how we measured the soft skills outcome. Two critical components of this meeting was the formalisation of the matrix for evidencing Key Indicators (KI), as well as providing the evidence to show how and where specific KIs where delivered, tracked, measured and marked as achieved by a designated quality officer. The evaluative process naturally led us to looking in to learning points for each partner as well as for the project as a whole; each partner was encouraged to take a reflective look at the training session that they were responsible for and extract key learning points that they would take into consideration and change should they have the opportunity to repeat the training session. Then taking as a collective how these would help enhance the next USTEP project. The meeting concluded with the Action plan of activities till the end of the project. U STEP The second training course of the project “Using Sport to Empower People” was held in Istanbul. 1. Economic and Dynamic Activity: Entrepreneurship is an economic activity because it involves the creation and operation of an enterprise with a view to creating value or wealth by ensuring optimum utilisation of scarce resources. 2. Related to Innovation: Entrepreneurship involves a continuous search for new ideas. Entrepreneurship compels an individual to continuously evaluate the existing modes of business operations so that more efficient and effective systems can be evolved and adopted. 3. Profit Potential: Without profit potential, the efforts of entrepreneurs would remain only an abstract and a theoretical leisure activity. 4. Risk Bearing: The essence of entrepreneurship is the ‘willingness to assume risk’ arising out of the creation and implementation of new ideas. New ideas are always tentative and their results may not be instantaneous and positive. – Broader understanding of practices, policies and systems in education, training or youth across countries: Youth workers will learn to use Youthpass and the Key Competences to support young people through creative process of skill harnessing, self-reflection and documentation of the personal learning process. The underpinning philosophy of the training session is to use Informal and Non Formal Learning Methods and the beauty and power of Martial Arts to equip and enable people more specifically Young People with the character traits, social skills and high order competences necessary to compete effectively in the 21st Century economy and society. The key overriding objectives for this training as listed above where achieved using the Martial Arts as a tool for Self Discovery, Self Analysis and Self Mastery. Aspects of facets of ‘Self’ was explored on many levels and participants gained an understanding and acceptance for difference of persons (personality profiling) and cultures. Participants were led on a journey of self awareness, self knowledge and self understanding as well as engaging in various Martial Arts training. For some participants their abilities were attuned to and had natural insight in the nature and dynamics of self awareness and self mastery, whereas, for others it was a completely strange concept, exposing vulnerabilities. Various elements of the training left an impact on the participants; this will continue to resonate in their soul as they reflect on themselves and their newly developed skill, over the coming weeks, months and years. What are my desires regarding my current situation? How do I feel about it? How do I perform best? What is my degree of certainty that I’ve got what it takes to accomplish the job at hand? The impact of this Self Mastery training is thus: Participants had the opportunity to develop their self leadership, interpersonal, intercultural and team working competencies, as well as behavioural traits that will empower and encourage them to face the future with a Confident Hope and Boldness. The long term benefit of this training is such that it has started the process of developing young people who have the ability as well as maturity of character to play a key role in contributing to building a community be it a social community or business community, in which a majority of it populace are inspired to be owner of business, job creators in their communities. The Self Mastery training exposed the participants to new ideas which led to improved self analysis & reflection, proactive and quick thinking on their part; inspiring them to go into their respective communities to motivates and encourages the young people of their community to work on themselves, to communicate with people from abroad, to travel abroad, to participate in some European projects without fears. A transcendental the long term benefit of this project is that participants learnt the advanced, yet transferable skills, attitude, aptitude, principles ethos, concepts and techniques that will help promote the habit of self reflection [facets of self, self identity, self transcendence, self leadership, self confidence, self awareness, self assuredness, self reliance, self discipline and self esteem] for Self Mastery as a tool for effectiveness and excellence in all sphere of life and work. The Self Mastery training encompassed on the surface, a highly focussed, structured, self-driven, and power based discipline (Martial Arts), alongside an open minded team spirit ethos and enigma of Human Dynamics. Conventional wisdom teaches that naturally, one would repeal the other; this training looked beneath the surface to reveal that such activities are rich in self awareness, self understanding and self regulation which are key dimension for Personal Development and Growth. As a result of their experience during this training session, some of the participants have expressed an interest to start up Martial Arts training, not as a need to learn how to fight, yet, to engage with its leadership philosophy and ethos as well as its framework for self mastery. Asked which Martial Arts they enjoyed the most, Kick Boxing won by a land slide, followed by Tai Chi; Kung-Fu was the least popular. When probed as to why Kick Boxing? 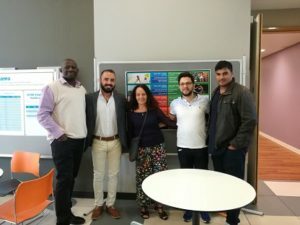 One of the participants, said, “I liked the fact that I was able to vent my frustration and clear my head, by getting involved with the pad work in Kick Boxing, and I could readily see the self defence application in the techniques that we were learning”. Kung-Fu, the general consensuses was that it was too complex and intricate. As a recommendation, they would have preferred more time and days be spent on Kick Boxing sessions. The Partners from this training expressed interest in establishing cooperation with the local stakeholder; talks have already began which should lead to developing a Key Action 1/2 project for the Oct 2017 submission.